We're food-obsessed, but sometimes we go through months (or years, even) when there's one particular food we just can't get off our minds. We know you've been there, too -- that avocado sandwich you had for breakfast, lunch, and dinner; the way you somehow figured out how to incorporate mustard into every meal; or the month you spent every Friday night with your stand mixer. Was there ever a time when you turned to the same ingredient, dish, or technique again and again? Did you once consider marrying your slow cooker? Did you go through a period in your life when you made 6 batches of granola a week? Share with us in the comments below? Posie: I realize this isn’t cooking, but after college my sister and I lived together and we used to make huge batches of Rice Krispies treats. Instead of spreading them in pans, we would eat them out of the pot with spoons. Let's hope our mom doesn't read this. Jane: I have an addiction to this homemade granola I make with pistachios, orange blossom water, and dried cherries. I love it so much that I ran home to bake a batch after my second interview with Food52 and did a morning drop off at the offices the next day (naturally, in mini mason jars). Bridget: A few winters back, I charred a few greens for a salad. Then I charred a few more the next time. Eventually, I was charring all the greens. It extended until every dinner had a blackened vegetable on a plate. The children eventually rebelled. Amanda S: I ate a toasted bagel with cream cheese and Fruity Pebbles, open-faced, in two heaping, colorful halves, for breakfast every day of the fifth grade. I have recreated it in my adult life and it is still delicious. Erin: When I was in pastry school, I was obsessed with Asian cooking. After my first trip to Momofuku, I became obsessed with trying to recreate the steamed buns. I sweet-talked my way into my cooking school's Cuisines of Asia kitchen at night, where the chef let me experiment with his ingredients and industrial steamer. I ended up crashing the course for three months. 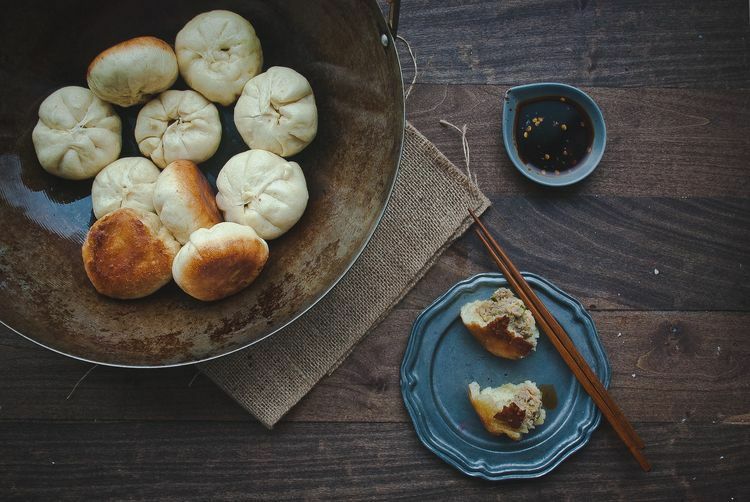 Two weeks after I felt I perfected the buns, David Chang published the recipe in Gourmet. Still, the crash course was so worth it. Haley: I spent six months eating quinoa with roasted tomatoes, feta cheese, and walnuts for lunch. I'm not sure why, because it's missing a lot of ingredients before it becomes a good quinoa bowl, but I did it without flinching. 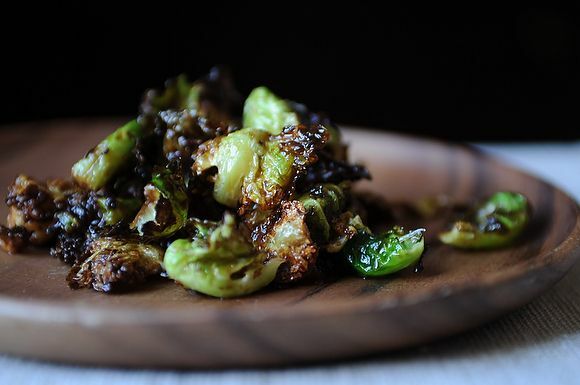 Michael: Every year between November and March, a rule goes into effect in our household: You may not purchase something at a store that sells brussels sprouts without also purchasing brussels sprouts. Ninety percent of the time we cook them the same way: halved or quartered, lots of olive oil, salt, cut side-down on a baking sheet, and roasted in a hot oven until dark brown. P.S. Bonus baby obsessions: My toddler Mirabelle often wakes in the morning asking for PA-DA (pasta), and won't eat yogurt if it doesn't have Cheerios on it. Heather: When we started using Tabasco Chipotle Pepper Sauce, our consumption of eggs, tabasco, and avocado toast started to get out of control. I had to put the breaks on when I took the recycling out one weekend and realized I was trying to hide the number of bottles from my neighbors. Channing: This ginger miso salad dressing on arugula with avocado and grilled chicken (and some variation of chopped radishes, bell peppers, and tomatoes) was my lunch everyday for about 4 months. What can I say? I know what I like. Ali: I’ve been averaging 2 fried egg and arugula sandwiches per day for the past few weeks. You could call it an obsession (or laziness). What's your latest cooking or food obsession? Share with us in the comments below! I ate toast with butter, hot sauce, and nutritional yeast every morning for 2 months, delicious! Jane! 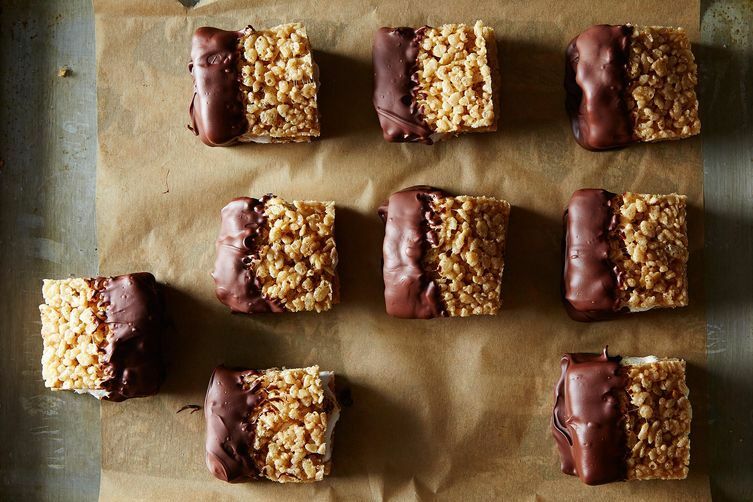 The world is crying out for your granola recipe. Right there with the Brussel sprouts comment. Roasted in the oven. Eaten with everything. All winter. Delicious!! Currently on an orange bender. Blood, Navel, Valencia, gimme them all! I eat them 4 at a time... for breakfast, lunch, and if I'm really feeling like I need to overdose on vitamin C, Dinner too!! It may be cold season but I doubt that I'll be getting sick anytime soon. Would love the granola recipe!! Also Ali- just want you to know all I am now on my 2nd fried egg & arugula sandwich since reading this... what is the food equivalent of an ear worm? A few months ago, I went to visit my sister who was studying abroad in Italy. The olive oil was so incredible that I shipped a bunch back to the states. After it arrived, I ate baguette with olive oil, salt, pepper, and good Parmesan every day after work. I would think about it ALL day. It was just so delicious. Fast forward one month and I've downed an entire bottle of oil by myself. Realizing that this habit can't continue at such a pace, that snack only comes out for special occasions now, or when I come across a particularly fantastic-looking baguette. Also, I'm pretty sure I will never stop making the Northern Spy Kale salad as long as I live. I make it every two weeks or so without fail. I'm currently addicted to Marian Bull's avocado toast (https://food52.com/recipes/26766-avocado-toast). I use two slices of sourdough bread, slather each with Mezzetta's Savory Garlic spread, toast them, top each slice with 1/4 a large avocado, then finish with big grains of pink Himalayan salt and some generous grinds of black-white-pink-green pepper. They leave me totally satisfied without feeling stuffed. I've tried various breads, but always come back to the sourdough. I can't imagine ever getting tired of them. I have eaten these for breakfast, for lunch, and for dinner, but never more than one meal per day . . . so far. Will you please share your enchilada recipe? I live in the Dallas area. The acidic soils of East Texas produce some heavenly tomatoes. In the summer when the tomatoes are divine perfection, I buy them by the barrel - specifically from J.T. Lemley at the Dallas Farmers' Market - and use them in a salad practically every day for lunch, always using the tomatoes, olive oil, salt, pepper, and good balsamic, and a few of these ingredients, or sometimes all: summer cucumbers, summer onions, kalamata olives, feta, fresh mozzarella, avocado, and last night's roasted corn on the cob leftovers, sliced off the cob. I really want to be left alone while I eat it, so I can enjoy it fully without distractions such as people and thoughts. The bonus is if I have a piece of baguette to sop of the last bits of dressing. My little girl loves this too and requests that I make her "Mommy's Special Summer Salad." Anchovy butter - got it from Renee Erickson's book and I can't stop putting it on everything, sandwiches, stirred into scrambled eggs, chops and steaks (of course) but also roasted veggies...mmmmmm. Avocado toast and sriracha on everything. In college I ate frozen vegan dumplings with greens tossed in for a month straight while they were on sale. 365 Frozen Strawberries from Whole Foods- out of the bag, as is. There is something about the texture. Weird. I am the same way with their frozen raspberries! Lemons. Lemon zest, lemon juice, Meyer lemon, regular lemon, preserved lemon. All over the place. Salads, pasta, in my drinks, on chicken & fish. I just can't get enough! As a kid, I was not down with the breakfast foods. For most of elementary school, the only thing I wanted in the morning was Campbell's Chicken with Rice soup. Or, if I was getting cray cray, Campell's Chicken with Stars soup.